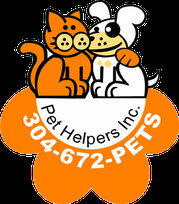 Contact - Website of Pet Helpers, Inc. If you are interested in applying to adopt one of our pets, please email adoptionisforever@pethelpersinc.org to request an application. We are an all volunteer organization and we attempt to respond to email inquiries as quickly as possible. Emails sent using this form will be directed to our main email address, information@pethelpersinc.org. Other contact information is listed below. Pet Helpers, Incorporated is a non-profit 501c3 rescue located in Fairmont, WV. All of our pets are living in foster homes, we do not have a facility. All of our funding is from donations, fund raising and adoption fees. If you would like to make a donation to help our wonderful pets, please use the donate button below. This big handsome guy is Strogen! Strogen is some kind of a hound mix weighing in at almost 60lbs. He is approximately 2-3 years old, neutered, flea treated, wormed ,utd on shots and microchipped. This free-spirited guy has a great personality is very happy-go-lucky and gets along great with all the other dogs in his foster home. He is Crate trained and housebroke This sweetie will make somebody a wonderful best friend. He is very smart and willing to learn. He will go to the door and ring the bells to let you know he needs to go out. With the energy this big boy has he definitely needs a fenced-in yard or someone who would take him to the dog park on a regular basis. He is going to be very loyal and loving to whoever adopts him and gives him his forever home . He is being fostered in Clarksburg WV if you were interested in giving this guy an amazing loving indoor home please request an application at adoptionisforever@pethelpersinc.org his adoption fee is $150.